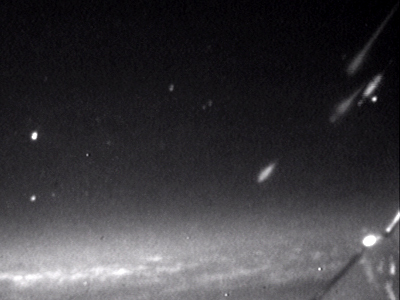 This video contains some 20 Aurigids imaged between 10:53 and 11:45 UT. Notice how the light from several meteors gets reflected by the airplane wing in the lower right corner of the field of view. Some preliminary 10 minute counts from the wide field camera. FOV=50 degrees wide by 25 degrees high. Times are possibly inaccurate and need to be shifted slightly ahead or back. Wow, what an event! It was a confirmation of a meteor stream model developed by Dr. Jeremie Vaubaillon of Caltech and Dr. Peter Jenniskens. This is a very rough composite of 4 meteors and I have loads of data to parse so more images will be posted soon. 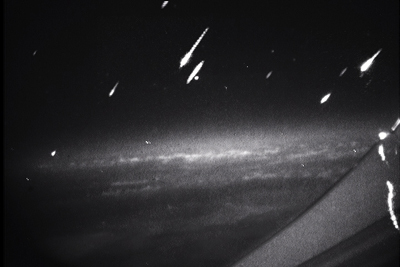 This image shows the airplane wing in the lower left side with reflections on the wing's leading edge, of the 4 brigtht meteors above. 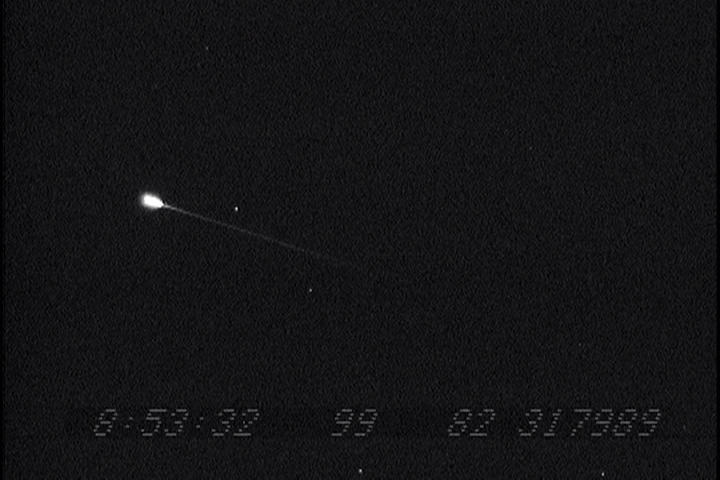 - 10 meteors were picked up in the 4 minute 45 second period (this one 1Gb video segment), in the wide field camera pointing to a fairly high peak ZHR. Last night we took a test flight out of AMES and successfully mated the USAF spectrograph to the meteor tracker. There were an abundance of lightning strikes below the plane and in our field of view. 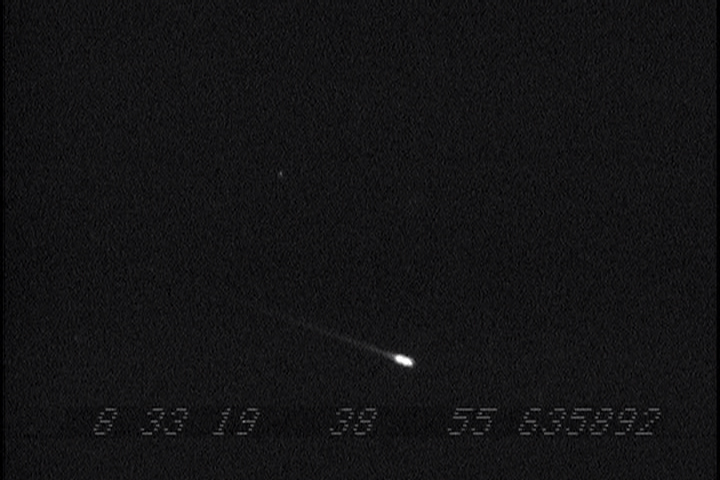 It was impressive to see and hopefully, there will be a sprite or two in the video I captured. Everyone on the plane is ready for the main event and the excitement level and anticipation is very high. Jeremie Vaubaullion is confident of his predictions for this event to materialize. Dr. Jenniskens is truely amazing in his ability and success to put together these airborn campaigns together. It was great to see several people I've met over the years and others that I have never met. A wonderful time is being had by all! The meteor tracker (AIM-IT) instrument was shipped last week and I've received the itinerary and will be on the right side of one of the two planes. This will put the radiant somewhere around 240 degrees with respect to the SW direction of travel meaning I'll be aiming at the meteor's backside. Being on the right side of the plane fits well with the meteor tracker's mount arm that will hold the high frame-rate spectrograph. It might allow the instrument to be angled further towards a point opposite the radiant, lessening the phase angle, which will lessen the tracking needs allowing more mirror stability and longer uninterrupted runs of obtaining spectra. Plans are to run the spectrograph at 500 frames per second which should yield 16 spectra per video frame. Hopefully, we will not have any trouble integrating the spectrograph with the meteor tracker. It will be done late in the game but a fall back plan is for the tracker to image an 8x6 degree FOV in unfiltered light with its usual PC164 ExView High Res camera. The spectrograph will be mounted in a fixed direction. I fly out to San Jose early Thursday morning. Been a couple of years. I'll need a window seat to prevent me from whining like a kid. Last week, I integrated a new set of stepper motors and electronics that Pete Gural and I had built for a set of identical meteor trackers. This set is much newer and just a little crisper in tracking and overrun and backlash are lessened by maybe one video field or somehere around 10ms. The change also prevents the need for additional shaft overrun dampening that I'd employed on the old set of motors. We will attempt to integrate a high frame rate spectrograph into the meteor tracker but rather late in the game. I still need to drill a series of holes in the mount so it can be positioned precisely where needed. I also need to screw small rubber cushioners in to the mount bottom to dampen any vibrations caused by the plane. Preformed several tests of the software as to be able to precisely match the speed of the meteors based on a high phase angle. It is called fine tuning. The radiant will be behind the plane with gear looking out both sides basically boradside or at a 90 degree angle with respect to the radiant. In this case, the full speed of the meteors will be apparent where as looking near the radiant, the meteors are foreshortened and visually brighter because of a much smaller angle. I think in this case, it will be best to aim the instrument back towards the radiant as much as possible, in order to gather more light as the spectrograph does better with brighter things (as brightness is a function of time with a higher frame rate; faster the rate, the dimmer the image). Additional tests show placement of the mirrors will allow the meteor to be observed between the middle and edge of the spectrograph or camera's FOV, to match up with the diffraction grating blaze angles and while also aligning the spectra across the collector's long dimension. In this case, the spectrograph is rotated 90 degrees with respect to up and down. I'm taking a tera-byte disk instead of tapes because I can record the video stream without dropping frames or impacting the tracker's speed. Firewire made this possible where using USB 2 actually chokes the frame rate down in a strange way. 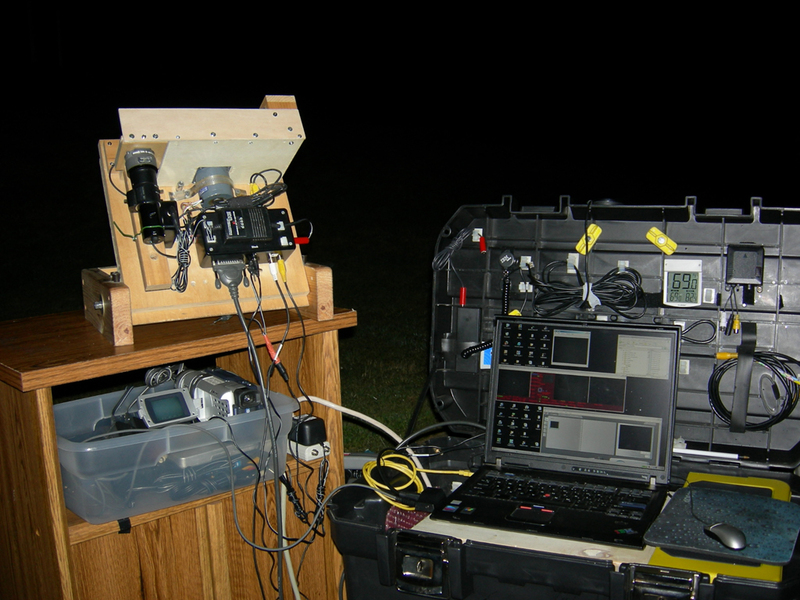 When the meteor tracker is quiet and not doing anything, the USB 2 data writing drops a frame or two every two or three seconds where firewire drops maybe only 10 frames per hour. However, when the tracker tracks, no frames are lost ever with USB 2. Go figure. The skies were pretty skunky but by 3:00am local time, I was able to start shooting. Limiting magnitude was around mag 3 with thick haze. The meteor tracker tracked very well. Had good skies last night into this morning and the meteors were abundant with several Perseids seen and imaged! I spent too little time focusing the high resolution camera, another lesson learned after the fact. Tracking and stability were good. Stability and backlash dampening is best achieved when velcro (fuzzy side) is used to wrap around the mirror drive shafts. Created mount for high frame-rate spectrograph (not shown) that elevates instrument to around 25 degrees. AIM-IT Meteor Tracker This is a picture of the meteor tracker. I'm optimizing and testing things, getting it ready for the Aurigid outburst on September 1. The instrument will be imaging with a high frame rate spectrograph operated and provided by the USAF. The spectrograph is capable of 10,000 frames per second (fps) for much brighter objects but will probably be run around 500 fps for the Aurigids. I will also be imaging the Perseid meteor shower tonight and tomorrow night (Aug 11/12 Aug 12/13) as my location will experience rather good skies for the mid-Atlantic area, for this time of year. Typically, only magnitude 2 or brighter stars have been visible for most Perseid events I've viewed from here but this time, it looks really promising and there will be a new moon! Stay tuned for images!